Verizon BlackBerry Bold 9650 coming May 27 | BlackBerry Blast! So much for the BlackBerry Tour line of devices. 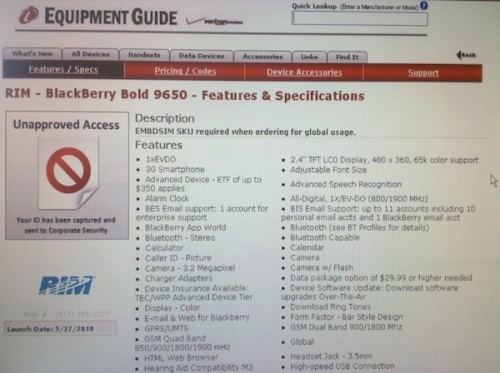 Rumor has it that the BlackBerry Bold 9650 will not hit Verizon on May 27. CrackBerry published this Verizon Equipment Guide which details a lot of the specs of the upcoming BlackBerry Bold 9650 for Verizon. It also lists a possible release date of May 27.